Description: Sexes similar. 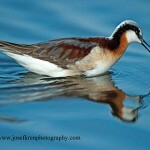 Very colorful; breeding adults have striking black-and-white head and bib pattern, a black-and-chestnut back, white belly, and orange legs. Female is a duller version of the male. Winter birds lack the color but retain the bib pattern and orange legs. Juvenile resembles winter adult. Behavior: Distinctive feeding behavior of turning over shoreline debris and rocks to get at food gives the bird its common name. 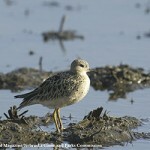 Habitat: Migrating birds can be found on mudflats, shallow ponds, and ploughed fields. 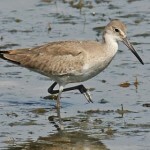 Where in Nebraska: Occasional to rare spring migrant in eastern part of state. Rarely seen during the fall in Nebraska. Rare casual fall migrant statewide. 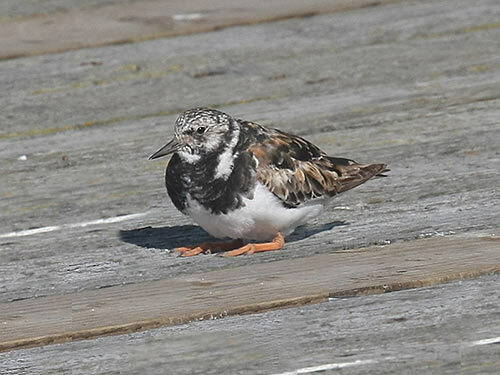 Fun Facts: Ruddy Turnstones get their name from their feeding behavior of turning over stones and other objects to look for insects. Females migrate before young fledge.